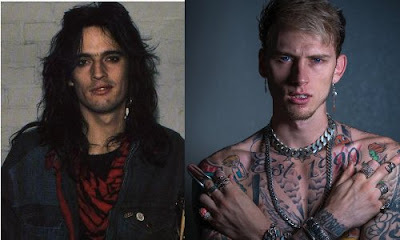 Home / -News- / Motley Crue / Tommy Lee / Machine Gun Kelly to Play Tommy Lee in Motley Crue Biopic "The Dirt"
Machine Gun Kelly to Play Tommy Lee in Motley Crue Biopic "The Dirt"
Machine Gun Kelly has been tapped to play Tommy Lee in a movie biopic about rock group Motley Crue. The rapper and actor, real name Colson Baker, is set to play the drummer in a Netflix's movie adaptation of the band's 2001 autobiography The Dirt: Confessions of the World’s Most Notorious Rock Band, according to Variety. The Bad Things rapper confirmed the news by sharing Variety's story on social media alongside pictures of Lee at the drums, Lee with his bandmates Nikki Sixx, Vince Neil and Mick Mars, and with his former wife Pamela Anderson. "and it’s finally announced," Kelly wrote ahead of nervous face and clapperboard emojis. "excuse me for being crass but....HOLY F**KING S**IIIIIIIIIIIIIT!!!!!!! @variety @netflix @MrTommyLand." Tommy himself told his followers on Twitter that the movie, titled The Dirt, would begin production in February, by writing, "Hey kids! Good news!!! The Motley Crue movie 'The Dirt' has begun pre production! Starts shooting in Feb! Here we go!!!" A fan replied to the news and asked who would be portraying him, and Tommy replied, "Machine gun Kelly!" Kelly, 27, who has previously starred in Beyond the Lights and Nerve, also told his fans that he would be taking up drum lessons with the help of his brother. He tweeted, "i got the movie to hire my little bro as my drum teacher. kept it in the family. i WILL learn the drums and finish the new album before we start filming." The memoir follows the group's rise in the '80s and their highs and lows along the way. It has been adapted for the screen by Rich Wilkes and Tom Kapinos and will be directed by Jeff Tremaine, who helmed the Jackass movies. Members of Motley Crue, which disbanded in 2015, are co-producing. An adaptation of The Dirt has been gestating for more than a decade, with Paramount Pictures, Focus Features and MTV Films all attached to it at different times. The cast for the remaining bandmembers has not been confirmed, but it was rumored in December that Douglas Booth was in talks to portray Nikki Sixx.